How to remind customers to pay their balance due? Learn how to use the payment plan feature to automatically request balances due from your participants on a predefined date. Learn how to use the payment plan feature to automatically request outstanding balances due from your participants on a predefined date. You can do so with our "Payment Plan" feature, even if you intend to collect the remaining amount in just one installment. Let's say you are selling a trip for $3,000 that starts on May 1st. You are collecting a $500 deposit when the participants book. Your foresee that the remaining $2,500 will need to be paid until 30 days before departure. You can now integrate this payment condition when you create your booking page. Under the "Pricing" tab, click on "Add Payment Plan", but set the number of installments to one. Then, set the date for this "Final Payment" to April 1st (30 days before departure). 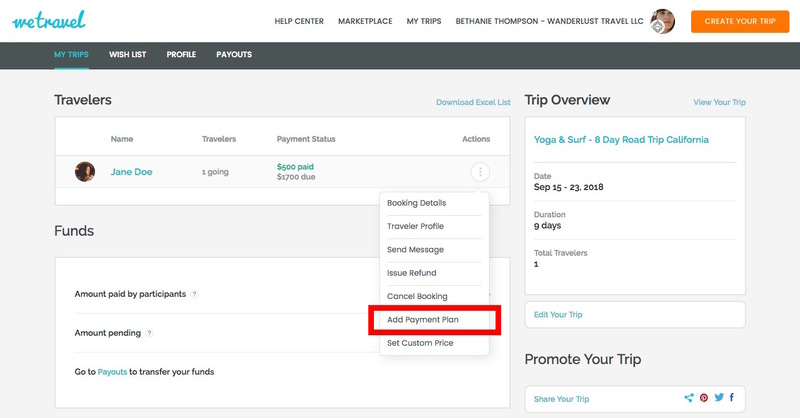 This way, WeTravel will automatically send reminder emails to your participants as the due date of the final payment is approaching (learn more about the email reminder schedule here). This allows you to focus on growing your business instead of sending payment reminders to your customers. See here how to set up payment plans or contact us if you have any further questions. PS: If you don't want to fully automatize the process it's easy to remind your customers yourself with a couple of clicks at your own convenience. See more here.